I made these recently for a Taco Tuesday party, and cannot tell you how delish, and easy they are. I have not really experimented with carnitas, but will definitely do it again. And, super affordable! I found this recipe on the Food Network, thanks to Melissa D’Arabian and then did a little “Connie editing” as I always do. I encourage you to yank out that slow cooker, cuz it’s certainly too hot in Kansas for anything other than the grill. Give this a whirl, and leave comments below if you create your own version of happiness. Oh yeah, and don’t forget that you can get these ideas, ramblings and recipes delivered to YOUR inbox! Time: Prep: 15 min, Slower the cooker, the better! Rinse and dry the pork shoulder. Salt and pepper liberally. Mix the oregano and the cumin with olive oil and rub all over pork. 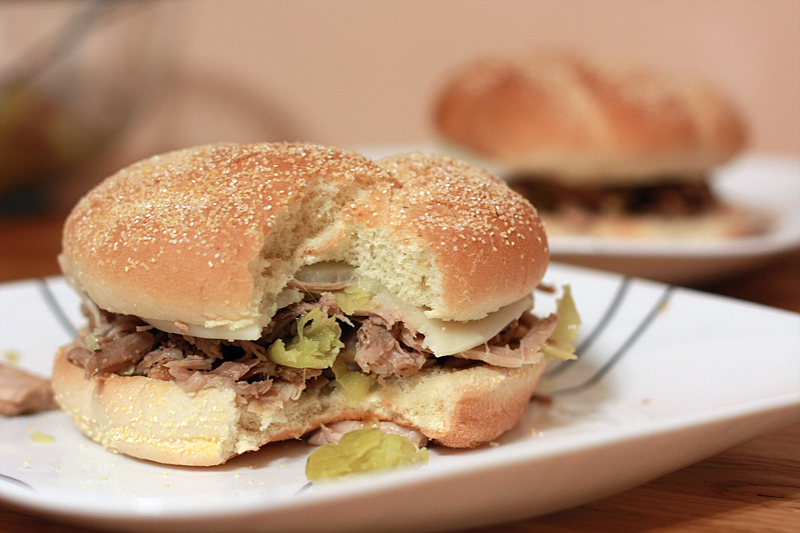 Place the pork in a slow cooker and top with the onion, garlic, and jalapeno. Squeeze over the juice of the orange and add the two halves. Cover and cook on low for 8 to 10 hours. Once the meat is tender, remove from slow cooker and let cool slightly before pulling apart with a fork. In a large saute pan, heat the vegetable oil over high heat. Press the carnitas into the oil and fry until crusty on one side. You have a ham bone, now what?? How many of you plan to cook a ham for Easter? Ooohh, I can see your hands in the air! The dilemma is solved, my friends, with what to do with that dang ham bone, in this post. Bottom line, do not throw it away — that Easter ham is the gift that keeps on giving! I cooked a ham after Christmas, and froze the bone. Since we have had all four seasons in one week, today being foggy, chilly, and rainy, I thought ham and beans might just fit the ticket, plus it can cook away all day in the slow cooker. If you have read other posts of mine, you might have seen that I’m a fan of Southern Living magazine. I’m a midwest girl, but that magazine will give you some of the best recipes and ideas ever! I grabbed this recipe out of the drawer, and voila, Spring Ham and Bean Soup was ready when we arrived home. I prepped everything the night before and threw it all in before heading out the door. The recipe actually calls for a 6 hour jaunt on high in the slow cooker, but since I was gone all day, I cooked it on low for about 11 hours. PERFECT!!!! You can find the recipe here but I’m adding it below for your convenience. So, if you are one of the lucky ones eating Easter ham, save the bone and take advantage of an easy peasy meal! Happy Easter, and thanks for stopping by! Stir together chicken stock, Great Northern beans, thyme, salt, pepper, garlic, celery, carrots, and onion in a 5- to 6-quart slow cooker. Place ham bone in the center of mixture; cover and cook on HIGH until beans are tender, about 6 hours, or low until you get home from work. Remove ham bone; let stand until cool enough to handle. Remove meat from bone; discard fat, gristle, and bone. Shred meat, and stir into soup. Not that we all need more chocolate this time of year, but hey, it’s the holidays, and we all need some good go-to’s for family, friends, work, etc. So here’s another drug recipe — well, not really. A co-worker makes this and swears by it. Super easy and no way you can mess it up. Happy holidays, and thanks for stopping by! layer all ingredients in a large crockpot, starting with peanuts. (at this point I hope you are using a crockpot liner). Turn the pot on low, cover with lid, and leave sitting for 2 hours. Remove lid and stir to combine. Replace lid and leave sitting for another 30 minutes. Stir again then spoon mixture onto wax paper or non-stick aluminum foil. Allow to harden for at least one hour. An elegant (and easy) recipe for delicious carrots! 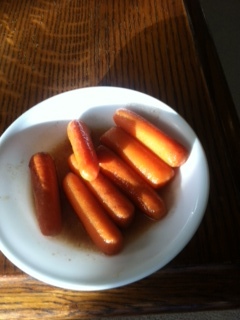 Oops, they look like little smokies, but are Orange Spiced Carrots! I started with one pound of baby carrots and halved the recipe. Add orange juice, brown sugar, butter and spices, and you won’t look back. And, a great way to get the kids to eat veggies, and would be a good holiday dish. Lastly, I made them in the crockpot so that made it even easier. 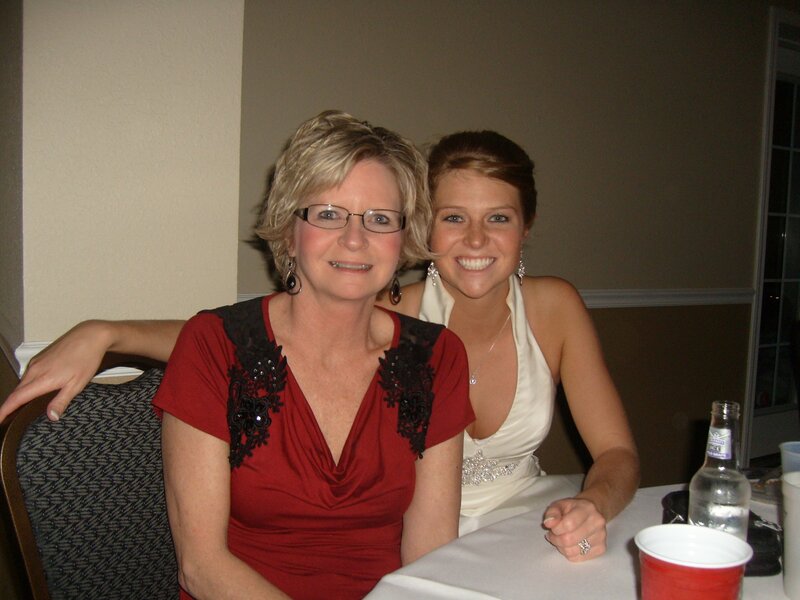 Hope you enjoy as much as we did, and thanks for stopping by my site! Happy Spooky Halloween! In 3 qt slow cooker, combine the first 7 ingredients. Cook on low, 4-5 hours, covered or until carrots are tender. In a small bowl, combine cornstarch and water until smooth; gradually stir into carrots until sauce is thickened. Sprinkle with chopped pecans for a nice addition. Another easy peasy slow cooker recipe! I first ate this delicious chicken after a long day on the lake…..Stacey had it simmering low and slow on the dock and it was oh so good once we returned from swimming in the cove. Don’t let the pepperoncinis scare you away….use the chopped ones, and they aren’t spicy at all. With the italian salad dressing mix and the seasoning, it all comes out delish. As with my bbq pork steak recipe, you can eat solo or throw on some buns, and it will be a crowd pleaser. And it’s very economical (cheap)! This pic shows some peppers, but typically they shred even more while cooking, they aren’t hot, and this is a delicious meal to come home to. We love it on individual cocktail rolls. Thanks for taking a break and hangin with me! Combine all ingredients in slow cooker. Cook low and slow for 6-8 hours, depending on amount of chicken. Shred for sandwiches. Easy and delicious slow cooker pork steaks! I continually get requests for meals that you can throw it in and when you arrive back home, voila! It’s ready! This is a super easy recipe that I believe maybe my hubster and his friend, Nick, invented. Might have had a couple of other lake friends in the mix, but they are the chefs of the crowd. Buy the CHEAP pork steaks — not pork chops. Throw on a little seasoning, BBQ sauce, and layer away. Low and slow and oh man, yummo! You can add veggies and eat solo, or put on a little roll and they’ll be gone pronto! Keep your eye open for an easy Italian Chicken recipe coming soon! Another crockpot favorite. Happy Friday! Place a liner in your slow cooker. 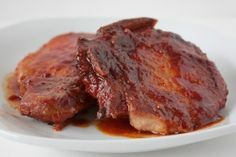 Start with a pork steak on a little bbq sauce on the bottom liner to keep if from sticking. Season, couple of blobs of BBQ sauce, and repeat layers. Cook on low 6-8 hours depending on the amount of pork you are cooking. Delish! Brandi shared this recipe with me last fall, and it’s really delicious. I’m really not sure that I call it soup, but even though it’s summer, it’s delicious and you can throw it in the crockpot and have a meal ready when you get home. Or, in my case, a meal ready back at the dock. I encourage you to be creative and adjust to your crowds liking. I hope you enjoy her recipe, and you can visit her blog here. In large heavy bottom pot, combine beef, onion , garlic and cook over medium-high heat for 8-10 minutes or until beef is browned. Stirring occasionally. Drain well. Stir in thyme, sugar, broth, tomatoes, tomato sauce, Italian seasoning and salt. Bring to boil over medium-high heat, reduce & simmer for 20 minutes. Add noodles and stir until tender. Stir in parmesan cheese. Put soup in ovenproof bowls and sprinkle with mozzarella. Broil until cheese is melted to desirable level. Recipes delivered to your Inbox!